Ever-popular weed control textiles may do more harm than good. Photo courtesy of Fiberweb. We at GV confess to a gardening faux pas: We found a roll of landscape fabric in our potting shed. Seasoned pro gardener and landscape designer Genevieve Schmidt tells GV readers why—besides choking the life from your soil and killing beneficial earthworms—rolling out the popular quick-fix weed barrier will leave your plantings lacking more than substance and style and what to use instead. With fall comes the scent of rain in the air, brilliant leaf color, some super markdowns at the nursery, and, oh yes, weeds. If you’ve been doing a good job of holding back the weeds all summer, you may have forgotten the scourge they become once water is plentiful in the garden again. A week or two of bad weather, combined with a holiday where you can’t get outside to garden, and your once-pristine flower beds can become a jungle of unwanted foliage. Like many others, you may be temped to reach for a roll or two of landscape fabric. After all, this slippery black cast-off from the petrochemical industry seems to be the go-to solution for many gardeners and landscapers. Unfortunately, weed barrier acts as more than a barrier to just weeds; it also blocks anything good from getting into your soil, such as all the delicious compost and organic matter which helps your garden grow. After a few years of rockin’ the fabric, all your years of work building up the soil into something crumbly, soft and dark are undone, leaving you with a barren dust bowl of a garden incapable of sustaining all those fancy-pants perennials we grow and love. But that’s not the only reason I hate it—excuse me while I rant. Ugh, landscape fabric is sooo last season! Though the trendsetters have been using black flowers and foliage to get that modern edgy look, nobody’s envisioning landscape fabric when they think of using black in the garden. Unfortunately, your landscaping fabric will show its dark side more often than that ebony-colored Onyx Odyssey hellebore will bloom, needing no greater excuse than a stiff wind, a frolicking pet, or the rustling foliage of an ornamental grass to brush a swath of wood chips off its slick surface. That sort of skin-exposing wardrobe malfunction is not exactly the hawt garden couture you were imagining! Is gardening a noun or a verb? Because if you actually like to garden, which is to say get in there, dig stuff up, and plant new things, landscaping fabric will make that a total chore. 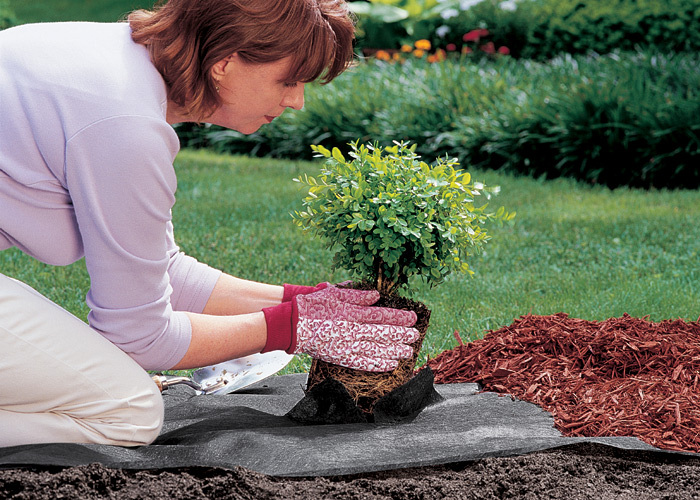 First you have to brush the mulch aside, cut a hole in the fabric, dig a hole, plant your new plant, sweep the soil off the fabric and smooth your soil perfectly, put down new pins to hold the fabric down, and move your mulch back over the surface of the fabric. That’ll make you think twice before indulging in an impulse buy at the nursery! And say goodbye to the weekend ritual of digging stuff up and moving it a foot to the left, and then a half foot forward, because a layer of landscape fabric that looks like Swiss cheese isn’t holding down the crabgrass. The mystery is gone. What about the annuals, biennials, spring bulbs, and those lovely reseeding volunteers which make life in your garden feel so spontaneous and fun? There’s not much mystery in the garden with landscaping fabric. Have pity on the flower that accidentally reseeds on top of the fabric. It may grow for a while, but just before it starts to bloom it will suddenly wilt and fail because it can’t get its roots into the ground. Even sadder are the spring bulbs which get pushed a little bit off course and try to grow up through the landscaping fabric. You might see a little bump in the fabric and wonder vaguely what happened to those tulips you planted last year, but by then, it’ll be too late. All of this might seem like something you could live with in exchange for never having to weed again, but unfortunately that’s not how it works. While landscaping fabric works great at holding down weeds sprouting from seeds that are already in the soil, think for a moment about how most weed seeds actually got there—wind. A layer of landscaping fabric will keep that top layer of weed seeds from sprouting and save you effort in that first year, but it does nothing to prevent new weeds from taking hold on top of the fabric. Worse, once that beautiful layer of wood chips you set on top of the fabric starts to break down, instead of contributing to the soil as it should, it forms a soft, fluffy layer of perfectly delectable growing media on top of the fabric, ideal for weed seeds to sprout. At that point, you gotta ask yourself, “did I seriously spend hundreds of dollars and a tiresome afternoon installing this stuff – only to end up back at square one, with the addition of deadened soil and a moonscape of black plastic showing through my mulch?” Why yes, yes you did. So, what’s a gardener to do? Well, prevention’s the best cure, and you can avoid weeds coming up in the first place by trying not to till the soil unnecessarily. Everyone’s soil has a bunch of dormant seeds down there just waiting for the chance to burst free, grow, and send their happy little seeds winging around the garden. The more you dig, the more you bring seeds to the surface that otherwise might never have sprouted. Beyond that, put down a good thick layer of wood chip mulch in between your perennials and shrubs. You really don’t need the landscape fabric in most cases; after the first year, the mulch alone is just as effective as the fabric, as long as there is enough of it—three to six inches. Mulch works in a number of ways—smothers the dormant weed seeds and keeps them from sprouting, and creates a situation on top of the soil where weeds a) find it hard to get established and b) are super-easy to pull out. Just don’t let the weeds get so big that they can sink their roots into the soil, or you’ll be right back where you started. Of course, if you truly have some icky weeds happening and need to start your garden off with a barrier, then sheet mulching is the lazy but effective tactic I used to get rid of most of my lawn. It also works great to keep dormant weed seeds from sprouting. It’s easy; all you do is trim or mow down the existing lawn or weeds as low as you can, then layer cardboard (my favorite) or sheets of wet newspaper (the more the better) over the weeds, and top with either compost (if you want to create a plantable garden bed) or a hefty layer of chips if you just want it to look pretty and stay weed free. Start sheet mulching now and by the new year, you should be good to plant! Lastly, if things seem to be getting away from you, there’s totally no shame in hiring some help. Landscape maintenance companies do this sort of thing as a matter of course and will already know which plants are weeds and which ones fall under the category of “$26 perennial I bought online and have been fussing after for the last two years in the vain hope it will someday look like it did in the catalog”. Or, if you mostly have mature shrubs and a few weeds growing in between, your neighbor’s high schooler may want to make a few extra bucks by pitching in. The cool thing about hiring help? It leaves you time to do the things you really love in the garden, such as trying to identify that weird shrub you bought last year, moving plants six inches to the right and then back again, and drinking cocktails. Or maybe that’s just what I like to do in the garden. In any case, landscaping fabric’s not the answer. It’s not effective, not stylish, and if there were a garden cocktail named after it, it would probably look and taste like used motor oil. Yeeeuchh. No thanks! Genevieve Schmidt runs a fine landscape and garden maintenance business in the progressive green city of Arcata in Northern California’s Humboldt County and blogs at North Coast Gardening. She has written for a number of publications, including Fine Gardening, Garden Design and The American Gardener. This entry was posted in Garden Advice, Uncategorized, Weeds and tagged Arcata CA, garden design, gardening, Genevieve Schmidt, Humboldt County, landscape fabric, landscape maintenance, landscaping fabric, North Coast Gardening, weed barrier. Bookmark the permalink. So true. Landscape fabric creates more problems than it solves. It sure did in my garden! Great post, Genevieve! This stuff is obnoxious, especially after it’s been torn and tilled into the soil. I love sheet mulching, and this fall I’ll be experimenting with some fleeces from my husbands sheep. Oooh, let me tell you! Moved into a house with a lovely convent garden complete with darling water features and many promising plants. However, on closer inspection we found not one, but two layers of plastic mulch under the bark. (Shakes head.) The “soil” literally was great balls of gumbo with water between them as if they were mere rocks. Plastic over that. Cheap potting soil over that. Plastic over that. Wood chips over that. We removed all plants, ripped out all plastic, and ran the tiller. It was an amazingly beautiful change, I am happy to say, and I miss that garden all the time. Nothing kills nut sedge. Nothing. 18″ of pine straw sounds fabulous and I BET your local armadillos love that soft soil as much as you do! I wish I had an armadillo-repelling solution, but I haven’t even figure out how to stop my local raccoons from digging in my garden beds, so I’m afraid I’m no help there. I have found that using cardboard instead of newspaper is a better choice in wildlife gardens, as sometimes critters will dig up and scatter the newspaper about, while cardboard is harder to shred. Oh, you are right, and when we first moved here, I used old U-Haul boxes that way, even under a new paver patio. However, they, also, dissolve eventually, and are a tad expensive to replace, compared to newspaper, especially when I have to dig it all up, anyway. We had a black Lab that kept deer away from our grapevines. But he learned to LOVE grapes. Sighs.